Sanctuary on Water – Stop looking this is it! 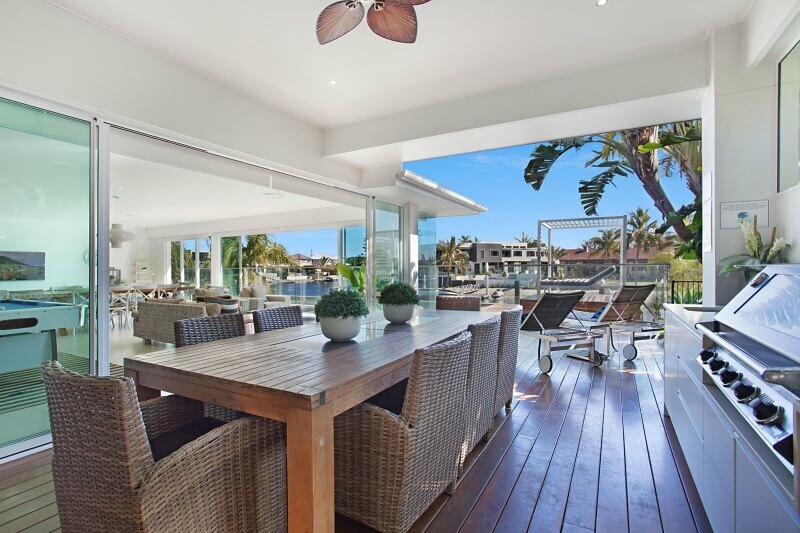 A modern single level, Gold Coast waterfront home encompassing everything required in a spectacular holiday home. The view is spell binding from the living areas and literally takes your breath away, ensuring you feel relaxed from the moment you step in. 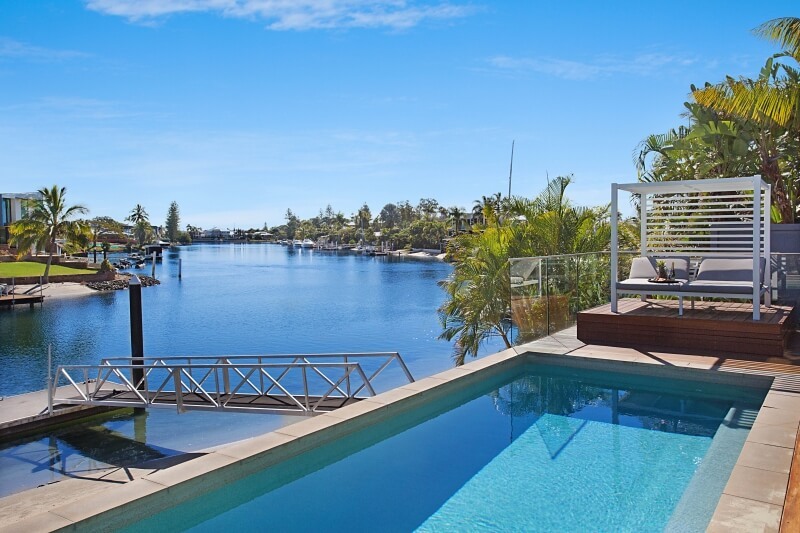 You cannot find a better location in Broadbeach Waters to holiday – just minutes walk from the restaurants, shops, Casino, Convention Centre and beach but in an amazing tranquil location – it is possible to have it all! 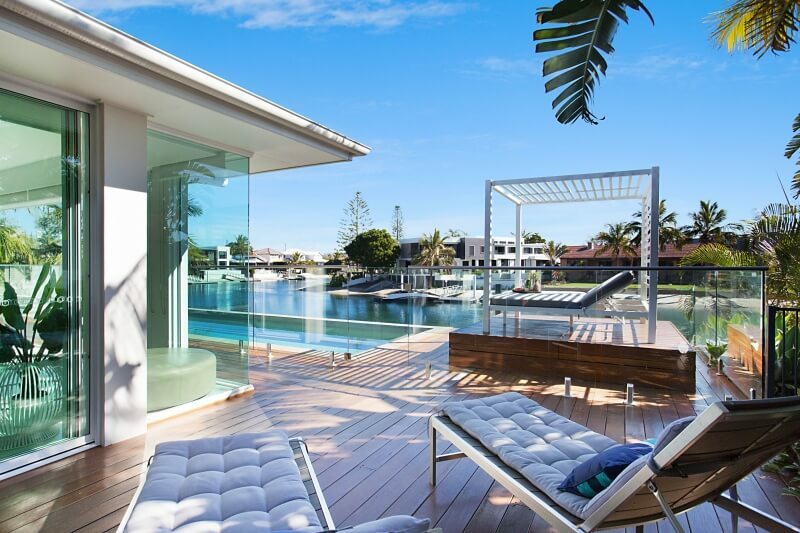 Sanctuary Waterfront provides extremely generous open plan living, five bedrooms, five bathrooms and a romantic outdoor bath for those who wish to watch the stars on a hot summers night. 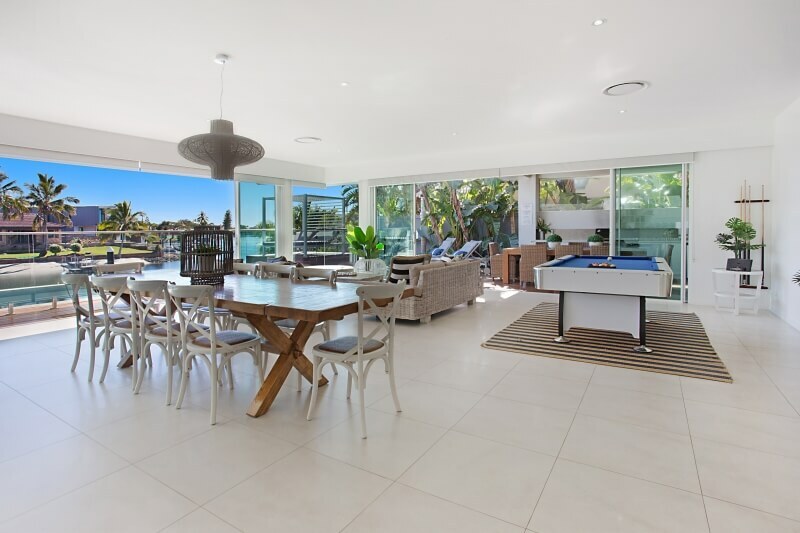 The living area overlooks the long water views and naturally, the swimming pool, large deck and outdoor living. You can sit out and enjoy the sunsets and the view up the waterway. All bedrooms have TV’s and four have ensuites. 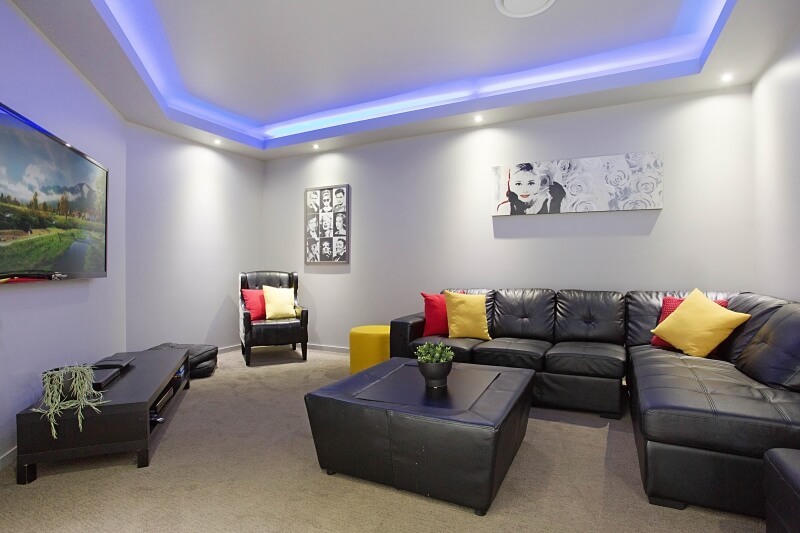 There is a pool table, Cinema Room with Sony Playstation 3, Foxtel, iPod dock and free internet available to take care of all your media needs. 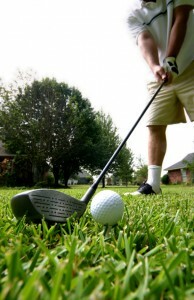 The home is fully air conditioned for your comfort and has a two car garage. The designer kitchen with stone benchtops is well equipped and has Miele appliances and a walk in pantry for those that enjoy cooking. The Nespresso coffee machine will save you a 3 minute walk to the cafes and the outdoor kitchen has a bar fridge, BBQ and preparation area for the fresh local seafood you might like to indulge in. 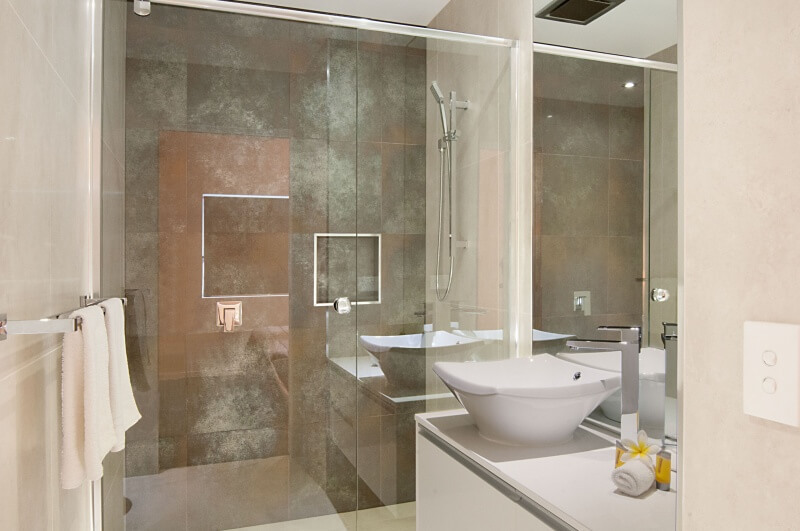 The master suite has a light filled ensuite and generous walk in wardrobe. 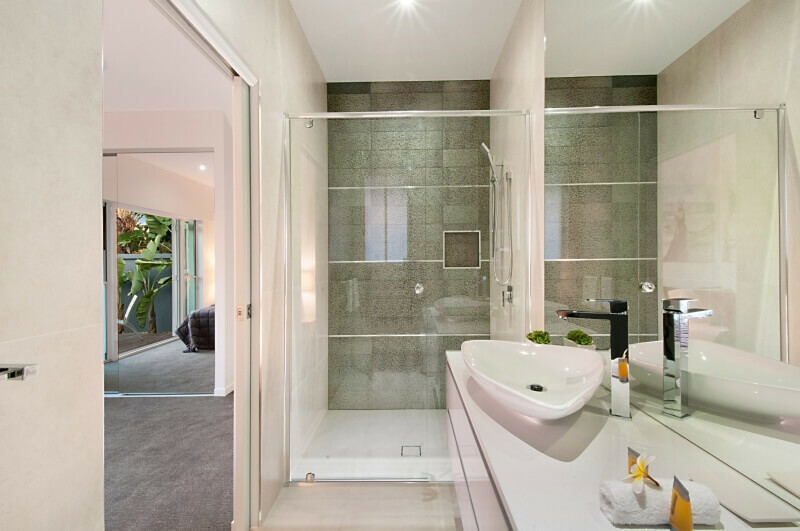 The indoor ensuite has a shower, toilet and vanities while the outdoor bath has been included for that tropical Queensland feel. 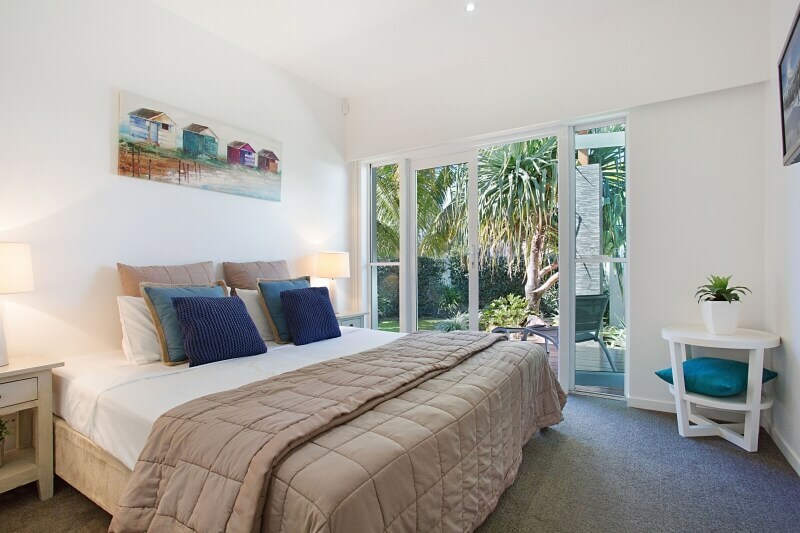 The main bedroom opens up to the outdoor living area and has waterviews. There are four other bedrooms and three have ensuites. There is also a powder room with shower. The bedrooms all have King beds (or can be split into 2 long singles), and TVs and bedrooms two and three have lovely French doors opening to a deck and front grassed courtyard area. This home has a lovely sandy beach and jetty for you to fish from or tie your boat to. It is just a short trip to main river so perfect for boaties. It has an iPod dock, Pay TV, Free Internet and telephone for local calls. It has a pool table and two iPod docks. The home is fully air-conditioned for your comfort and it has a 2 car garage. The five spacious bedrooms and five bathrooms cater for groups or families holidaying together allowing your own private space. There is a two car garage on the property. 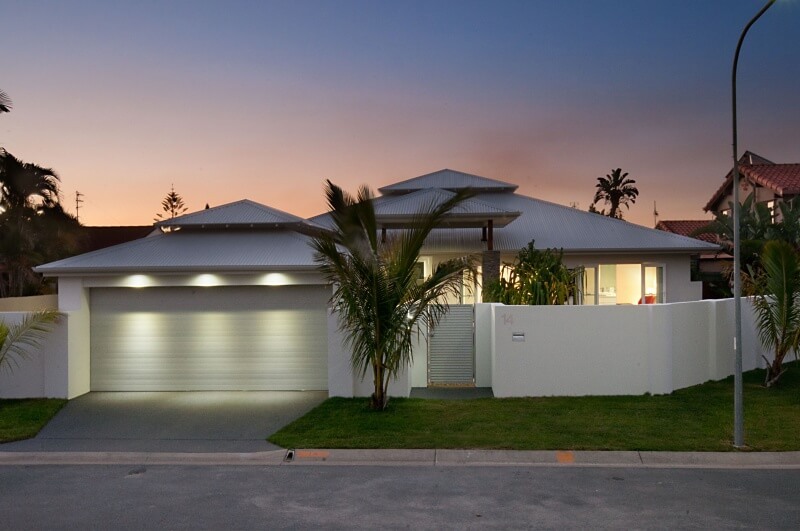 This home is situated in a premier location only 3 minutes walk to Broadbeach and 10 minutes to Pacific Fair. Coolangatta Airport is a 30 minute drive and Brisbane a 60 minute drive. Property has 10 beds and can sleep a maximum 12 people. Had a great time staying here for our family getaway. Have a toddler and house was great for all members. Lots of room, everyone able to have their own space, and beautiful outlook.. Would definitely stay here again…..
Have stayed in this property for the last 4 years and every time it blows our mind! 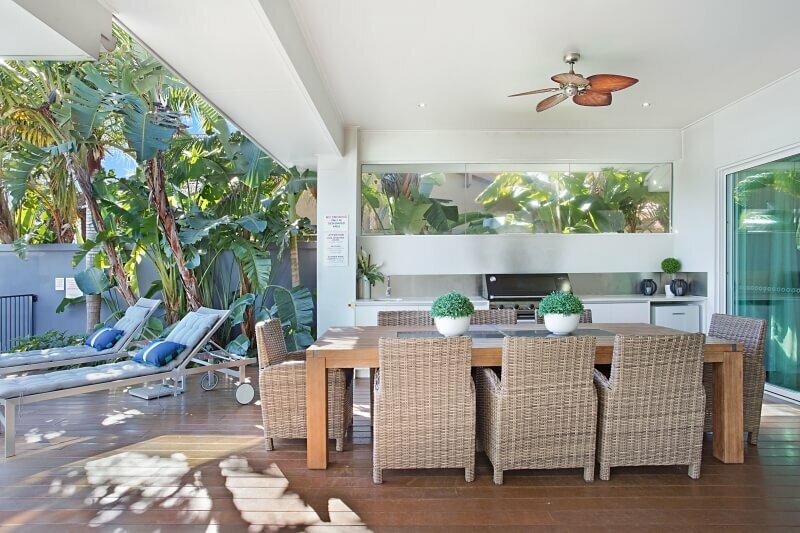 Perfect location, easy walking to Broadbeach and so close to a great cafe. Highly recommend! Great house lots of space and things to do for our family of eight and three generations. Close to everything you want, shops coffee trams buses, also an easy walk to all of them. A wonderful stay. Great memories to be made when you have all the family together in an ideal holiday home and we are glad that you enjoyed it. We hope you will visit with us again and don’t forget to let us know as you will receive a discount as a return guest. We are a family of 10. The house with 5 bedrooms is exactly what we needed. We had a fantastic stay for a week in sanctuary on water. The location is perfect with oasis shopping mall and pacific fair nearby. 10 min drive to surfers paradise. Thank you elite home for making our holidays special. Immaculate house 🏡 Amazing views I can say that I had the best 5 days of my life there. Location is great nice and quite and it’s only 10 minutes walk to the shops. The house had everything we needed to enjoy the holiday heated spa and swimming pool 🏊 I just can’t describe how much we loved this house I highly highly recommend it. Staff are more than professional they are very helpful specially Kylie and Bel. Thank you so much for the best house ever. I will definitely be back soon. “Wow! What an amazing place! 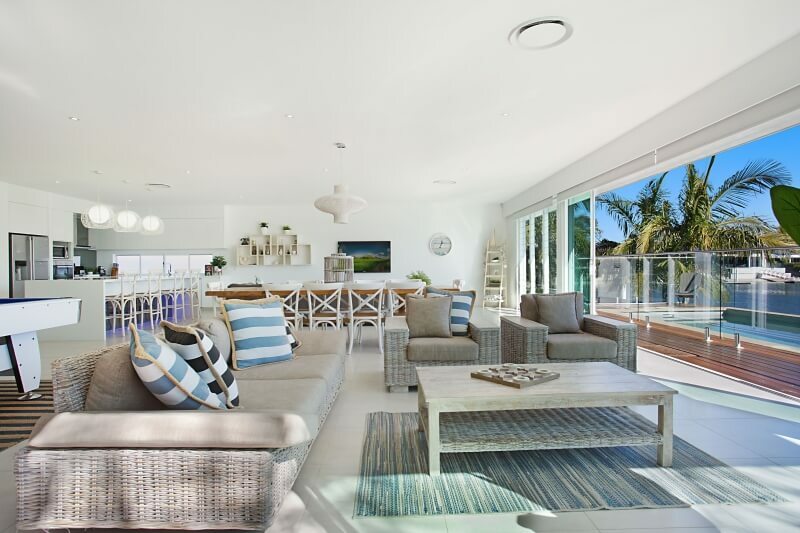 The house was beautiful and had everything we needed.The location was great, nice and quiet but an easy walk to the Broadbeach shops and beach front playground. It was the best we have experienced during a holiday”. “Had a fabulous week at the property. Great amenities and features. Loved the Alfresco dining area. 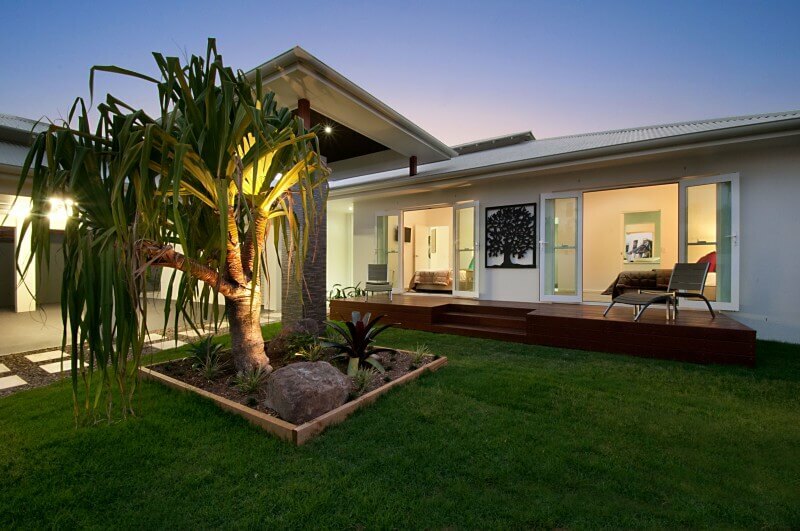 The house made our week on the Gold Coast very enjoyable. Would highly recommend to friends”. “This house is nothing short of spectacular. If you are looking for luxury then this is it. We could hardly bear to drag ourselves away from the house for even a day. Have not felt so relaxed in ages. Would definitely revisit”. “Absolutely spectacular house! Close to everything yet in a quiet and truly peaceful location. The house is very well appointed and luxurious. You cannot fault this property! There’s just so much space, it’s actually bigger than the photos suggest! Highly recommended and we’ll be back”. “This house is fabulous, with fantastic living and BBQ areas and a great pontoon for fishing. We enjoyed our stay and hope to return again soon. Our host, Karen, was very helpful and thoughtful. Thanks so much Karen”. “We thoroughly enjoyed our stay at this immaculate residence. The layout was perfect and all the amenities and extras made the stay very comfortable and luxurious e.g. media room, billiard table, outdoor BBQ area and the use of the Nespresso coffee machine. “Property & location perfect. 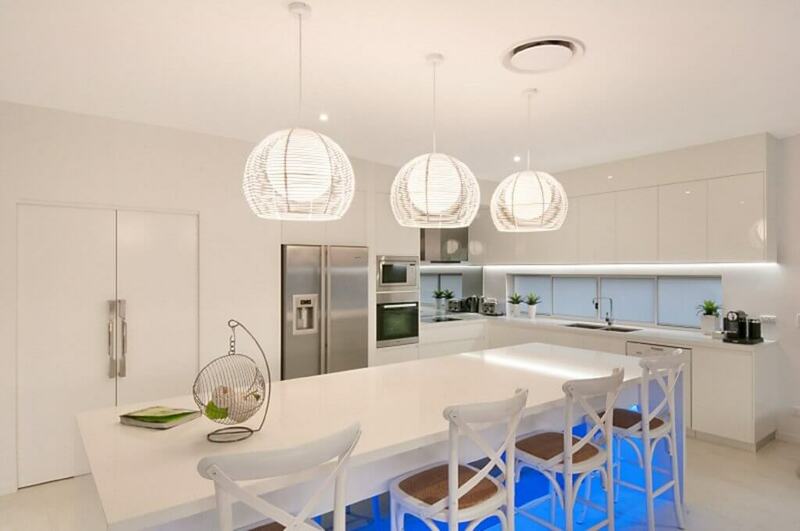 This property was Broadbeach Waters perfection. 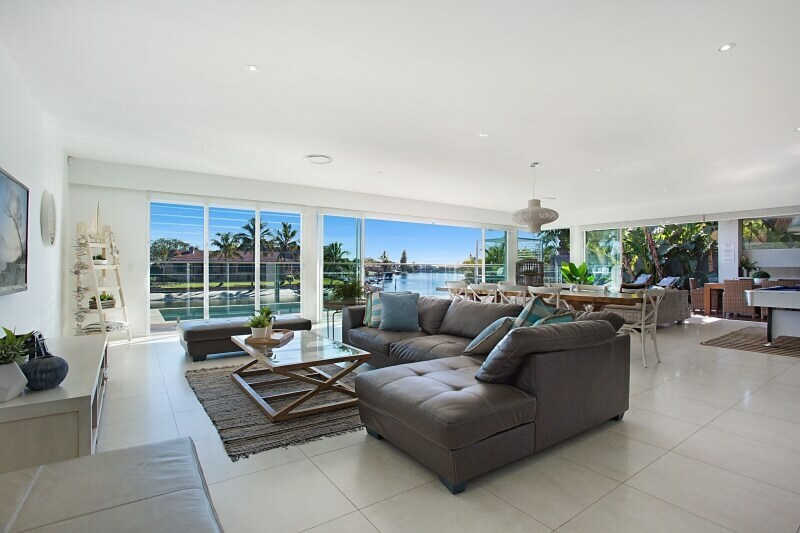 The location on the beautiful water amazing and a short 5 minute walk into the heart of Broadbeach The house was beautifully styled and perfectly set out. 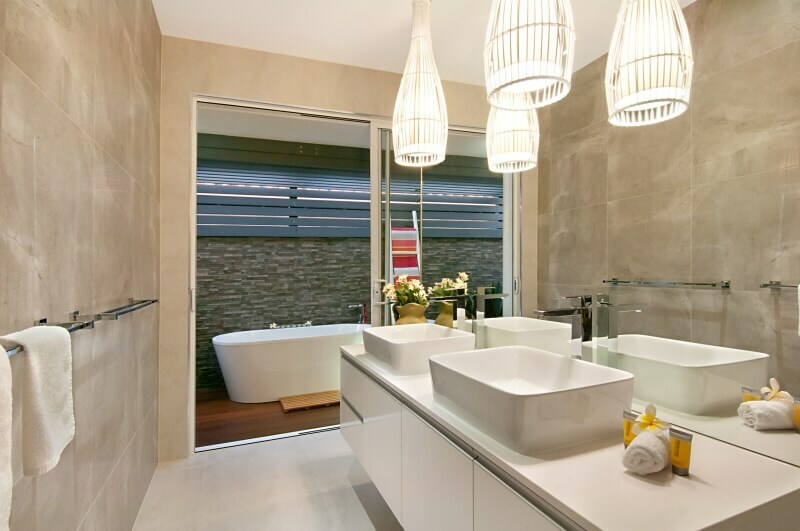 The main bedroom was a haven inside the house including an outdoor bath, pure luxury. Outside the pool, sauna and BBQ area were spot on with access to the beach. “Best Weekend of our Lives. 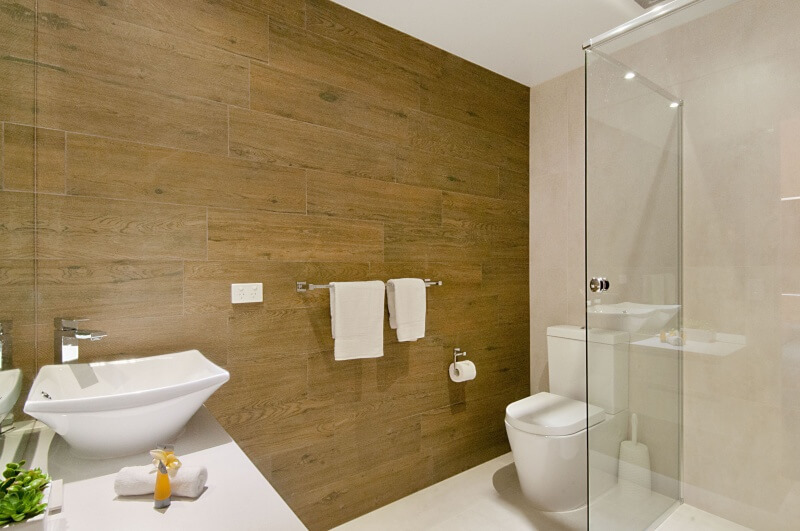 The house is spectacular and perfect for couples with everyone having their own space and bathroom. We always felt so comfortable and did not even have the need to leave the house at all. Amazing holiday accommodation. An amazing holiday home which we didn’t want to leave! Everything was exactly as described and the photos were spot on! The house is so spacious and immaculate, would definitely recommend this property to family and friends. Pictures don’t give this place justice! Absolute quality accommodation, far exceeding expectations. Walking distance to casino – we were in heaven! Spent more time at the home than planned as the place was exceptional, including enormous TV’s with foxtel. Spa was terrific. Will certainly be staying here again and taking the whole family. “Perfect for 8 Golfers. Been using Elite Holiday Homes for 5 years. No disappointment as expected. 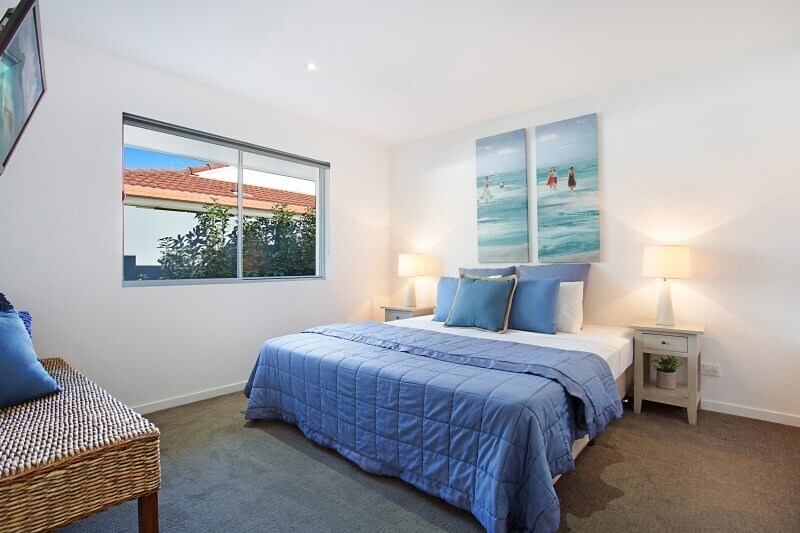 … located short strolls to Broady and the Casino. Excellent coffee shop at the end of Eady Avenue. “The Perfect Sanctuary. This property literally took our breath away upon arrival. Despite arriving in torrential rain, the elite team met us with a smile and friendly welcome and all the rain was forgotten in an instant when we walked inside the property! Our children LOVED the pool and movie room as did their parents:) (as for the first time in many years we were able to sit outside relaxing whilst the kids were entertained inside watching movies after being exhausted from all the swimming). Excellent location – walking distance to everything, including amazing coffee. Thanks Elite Homes – we will see you again very soon ! “Great Home in Great Position. We recently stayed at Sanctuary on Water with 4 other couples. All of us absolutely loved the house. The size of the home was great. The layout was excellent too, with plenty of cutlery and crockery. Very livable. The pool and spa got plenty of use. The home is in a very quiet neighbourhood, which we loved. 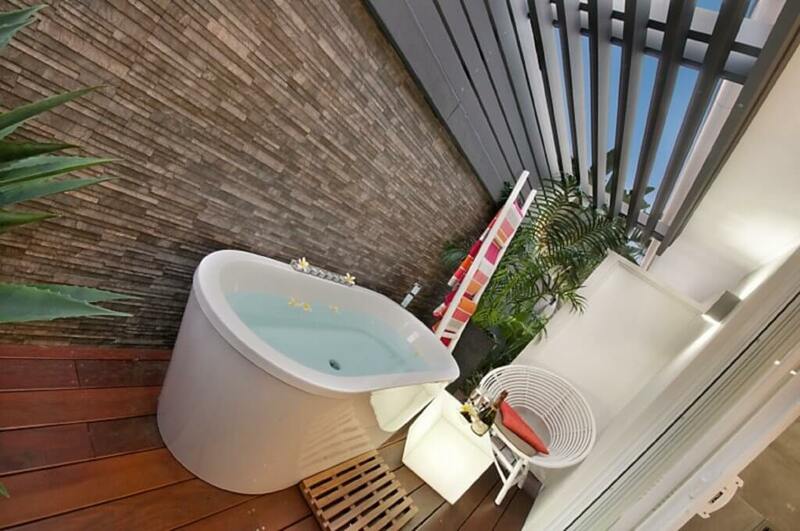 Within easy walking distance of the Oasis shopping Centre and many good cafes and restaurants. The Casino and Pacific Fair are close by too. 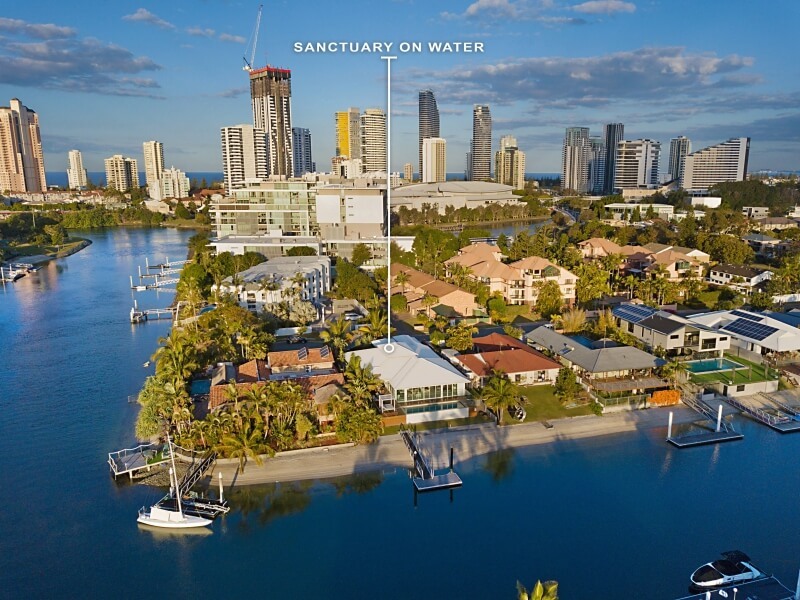 Would recommend Sanctuary on Water to anyone looking for a large home on the Gold Coast. “Very Good Overall. Enjoyed our stay at Sanctuary on Water last week. Property and customer service were very good. A slight negative was intense afternoon sun/heat at the back of the house made the outdoor entertaining area uncomfortable at that time. Lounge/sitting area furniture whilst comfortable are showing their age. 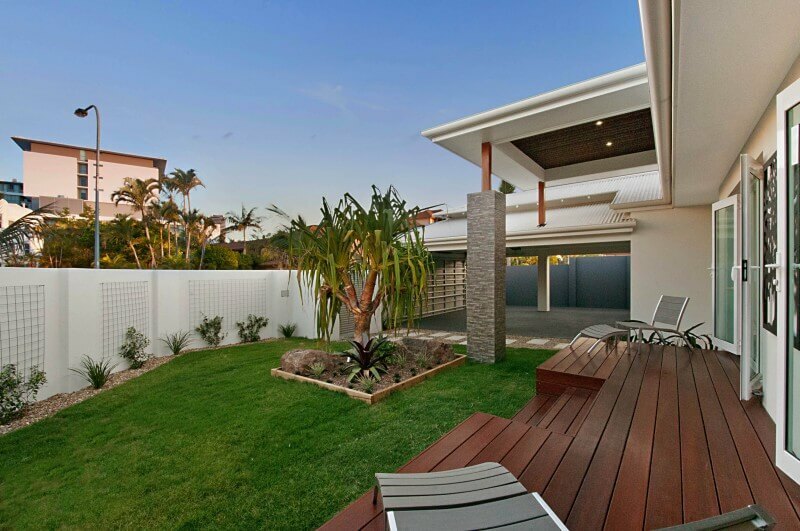 “AMAZING HOME” – Simply perfection. The house was amazing and our stay incredible. I will definitely use Elite Homes again!!! Very happy. “Perfect “time out” holiday.” We spent a great 10 day family holiday in this awesome luxury house. The house also contained lots of play toys for children. Location was excellent and very close to public transport and restaurants. 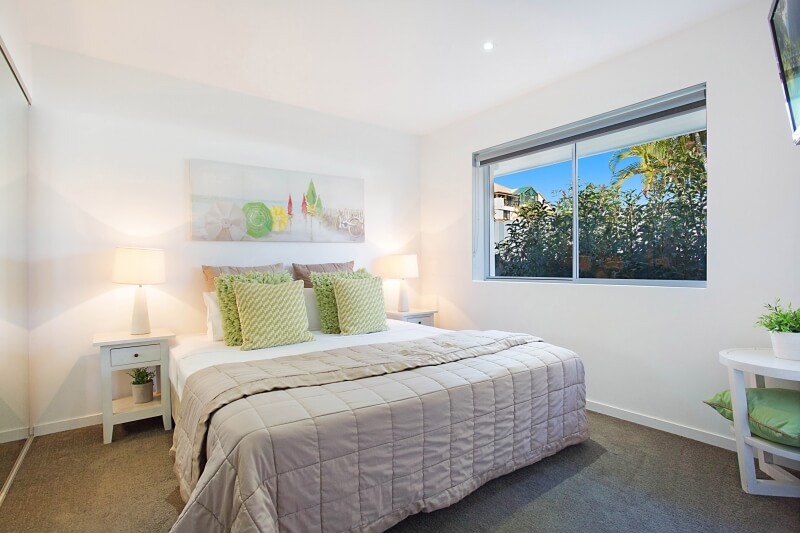 “Fantastic property” Our stay fantastic,house beautiful Easy walk down to Broadbeach,casino and pacific fair,great location. Lovely quiet neighborhood,kids had a ball in the pool & spa. Everything you need was catered for cards,books,toys and a pool table. We definitely return couldn’t rate high enough. “Fantastic family holiday!” Fantastic facilities for our extended family, spacious, clean and had everything we needed. Beautiful pool and spa, very relaxing place to stay. “Excellent Place to Stay.” We enjoyed our stay for my mums 50th Birthday. It was so relaxing and a great home For the family to all have seperate rooms. It worked well. Outstanding property” – We stayed here with our five children of varying ages – age 9 through to 20. There was something for everybody to do at all times – pool, spa, playing pool, fishing off the jetty, watching movies in the lounge or funky media room. The list goes on! We were a pleasant 10 minute stroll from the Broadbeach mall and all the restaurants. The house was so incredibly luxurious and we were all blown away by it. It was certainly a special and memorable holiday and we will be returning on at least an annual basis. 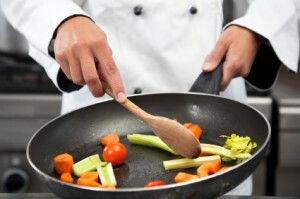 Every conceivable need was met by the managers including the service, features and facilities on offer. The attention to detail was amazing! Thank you for an unforgettable experience. Amazing Home” – After thoroughly enjoying our previous Elite home stay we didn’t think it could get much better but it really did! The house had a lovely light main living/dining area, complete with pool table, great outdoor entertainment. The location on the water was beautiful and peaceful and all bedrooms had their onw bathroom (4 of which were ensuite). The movie room and pool table were great as it meant children of all ages and adults were easily entertained. Location was also fab, near shops etc and on a quiet cul de sac roads. We hope to book again! “Stunning property!! 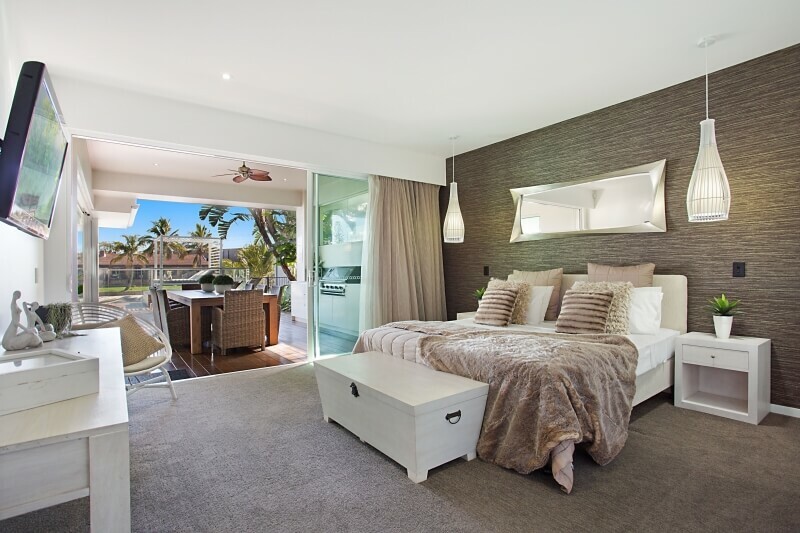 !” We thoroughly enjoyed our stay at Sanctuary on the Water Broadbeach Waters.. The house was amazing and caters for every age group. The infinity pool and spa was our favourite spot every day !!! 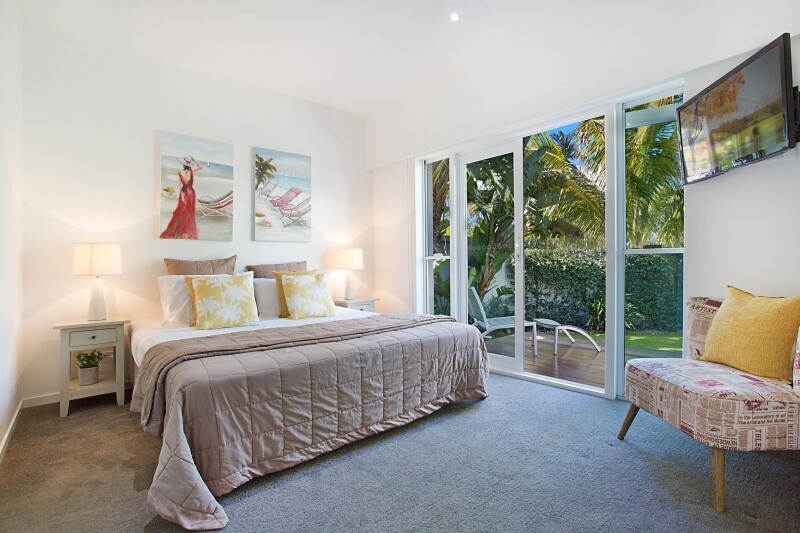 The location was perfect as it was walking distance to Pacific Fair shopping centre, restaurants, the beach and Jupiters Casino. We even caught some big fish off the jetty!! Would definitely recommend and stay again.. It was a great place to call home for the week. “Fabulous Property” Our family chose to spend four nights at Sanctuary On Water to celebrate our mothers 90th Birthday and we were so pleased we did. The property was big enough to accommodate the whole family plus visitors. The living area is very spacious and includes two sitting areas plus a ten seater dining room table. The kitchen was fully stocked with absolutely everything one needs in a kitchen. The master bedroom, walk in robe and ensuite were to die for. 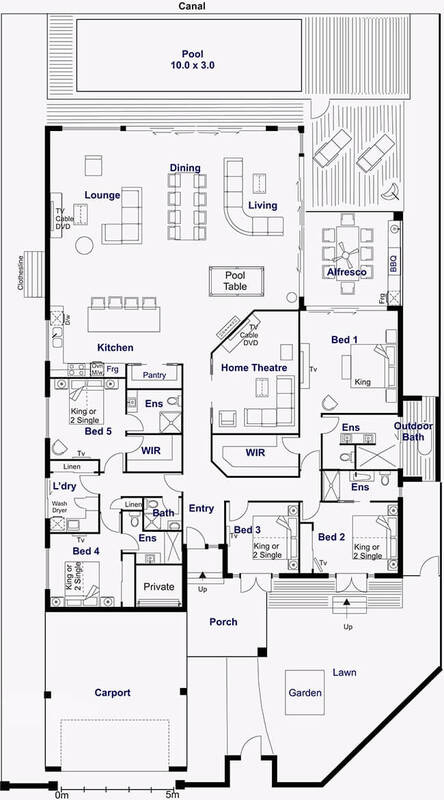 The other three bedrooms, all with ensuites, were a great size as well? The fifth bedroom is the original study and does not have a cupboard or ensuite. Then there is the pool, spa and BBQ area which was also very spacious. The property is a four minute drive to Pacific Fair Shopping Centre and The Oasis Shopping Centre. If you’re into walking take a comfortable stroll to Broadbeach where you will find many eateries, cafes, bars etc. Fortunately for me I will be staying at the property again for one week over Easter with a group of friends. 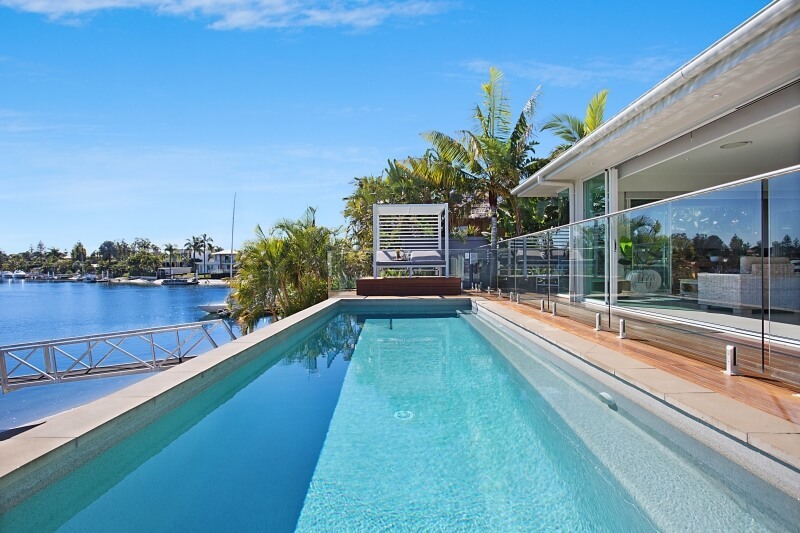 So, if you are looking for a great holiday home on the Gold Coast I fully recommend you consider Sanctaury On Water, you will not b disappointed.